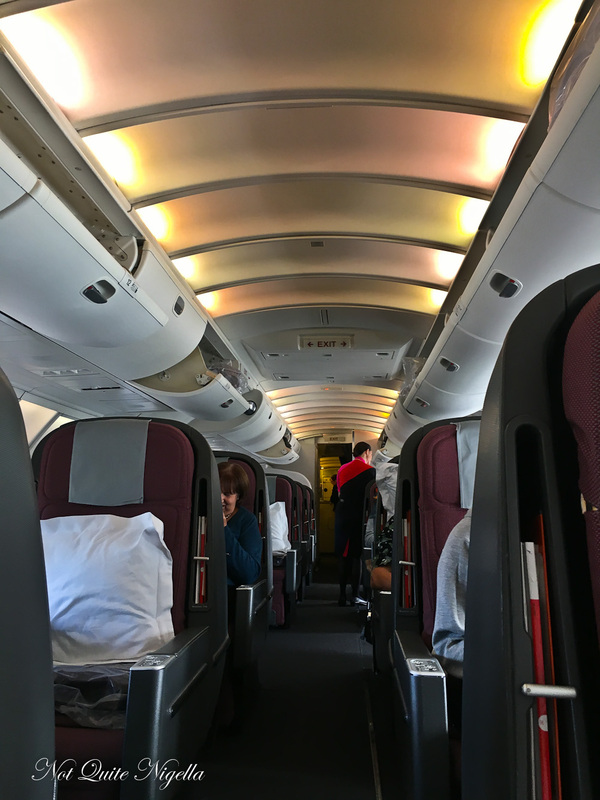 Take a look into the Qantas Business Class offering on the Boeing 747-400 for a 12 hour flight from Sydney to Santiago. Discover the new menu with goodies like tuna tartare Korean style and chicken katsu on milk bun with coleslaw! It's 9:30am. I'm really early for my flight. 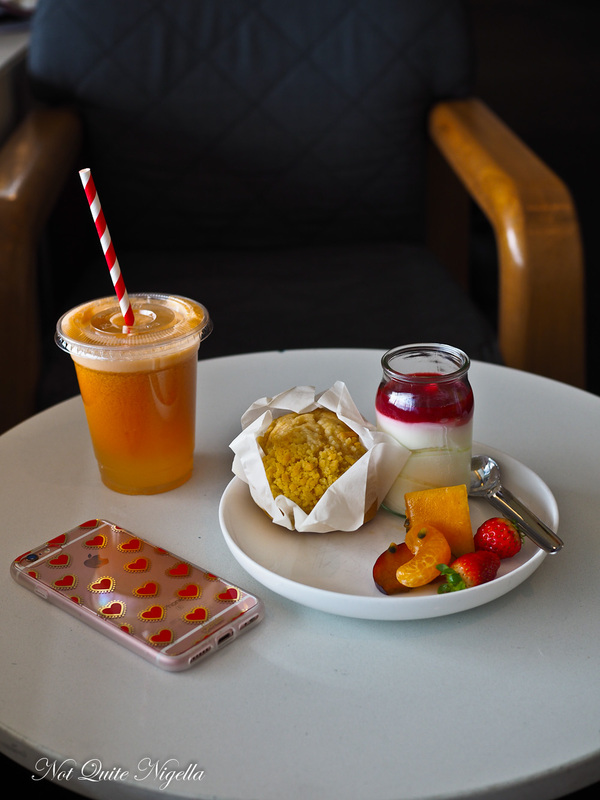 I'm waiting in Qantas's Sydney business class lounge and they're making me a freshly squeezed juice from the juice station (carrot, pineapple and apple). I'm inhaling the smell of bacon and studiously avoiding it while I pick at fruit salad, a streusel apple muffin (delicious!) and a raspberry topped yogurt. The woman next to me helps herself to hash browns, bacon, croissants and eggs. I inhale and look over at her. Don't mind me, eating vicariously next to you. I pass the time working and it's not long before I make my way to the gate and stop to buy a bottle of water. My ticket reads seat 11A or the first row on the upper deck. It's a fairly full flight but there are some seats empty. 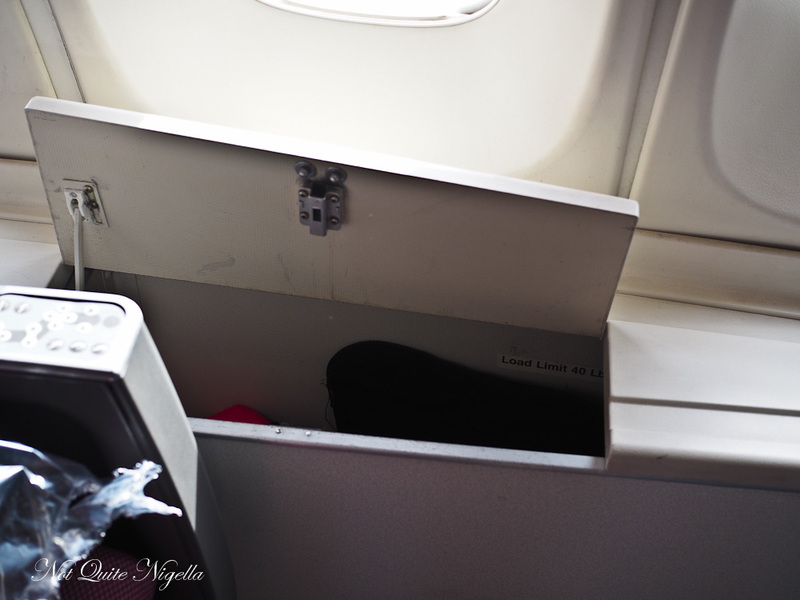 The seats on the upper deck of the B747-400 are good because there are generous side compartments for storage. I'm the person that likes to have lots of things around me on a long haul flight whether it be hand cream, laptop, camera and lip balm. I have two deep bins to myself to put my computer, handbag, clothes, shoes and toiletries. There is a delay taking off-something technical about a sealant or adhesive and as nobody wants things to fall off mid flight no-one seems particularly bothered. It takes about an hour to rectify the situation and then we are taxiing down the runway with the captain explaining that they have 2 tonnes of extra fuel that will allow them to fly at a higher mach so we won't lose much time. In the meantime they've taken everyone's orders and the staff have introduced themselves personally. 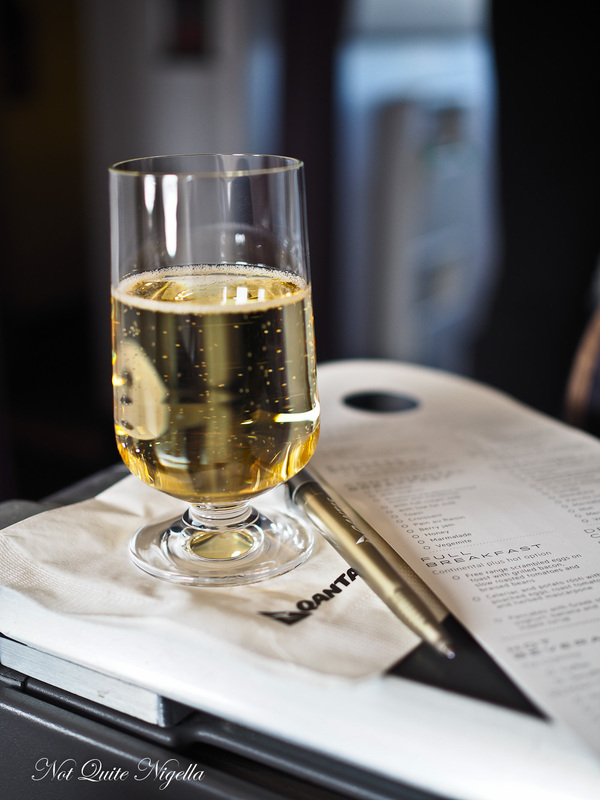 We've all been given champagne, orange juice or water and wet towels. 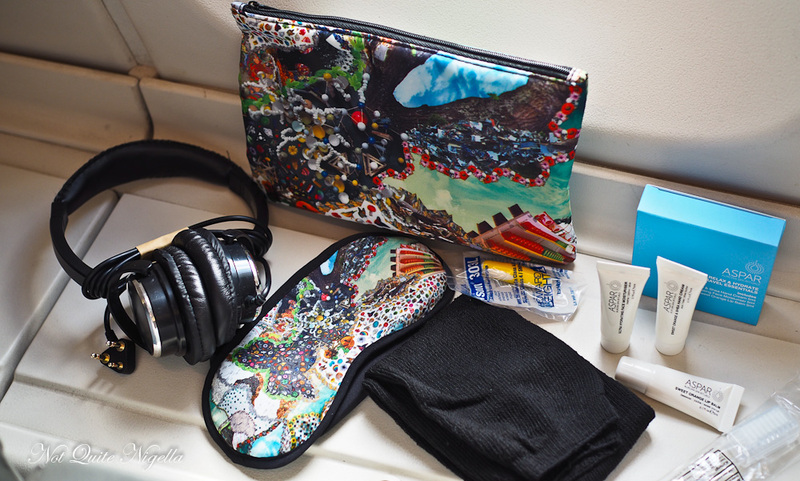 Amenity kits are handed out-the design has changed and there are a few to choose from. The striking colourful patterns are by Australian artist Jacob Leary. 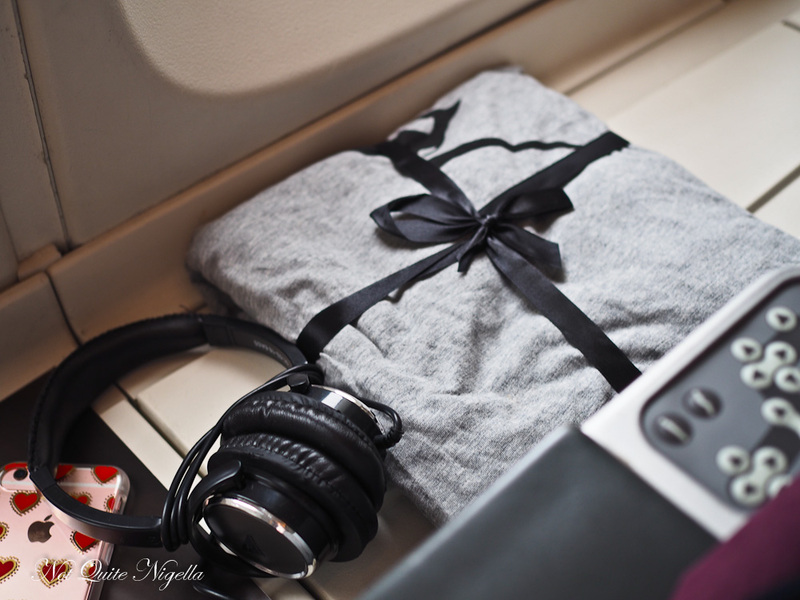 In the amenity kit there is a patterned eye mask, socks, toothbrush and toothpaste and a box of 3 Aspar products: a hand cream, face moisturiser and lip balm. A set of Peter Morrissey pyjamas are given out too. I plug in my phone having depleted the battery while waiting for take off and place the noise cancelling headphones on. It's 12 hours to go and I will wake up in Santiago in the opposite side of the day. The woman next to me is friendly but her screen doesn't work properly so she has to switch to another seat. My stomach is growling and I've got a headache. That'll teach me to eat fruit salad. "Should have eaten the bacon," I say to myself. "Can I get you something? Perhaps some cheese (Forme D'auberg blue and Two Sisters Isabella), fruit and some wine?" says the lovely head of the crew Ross. 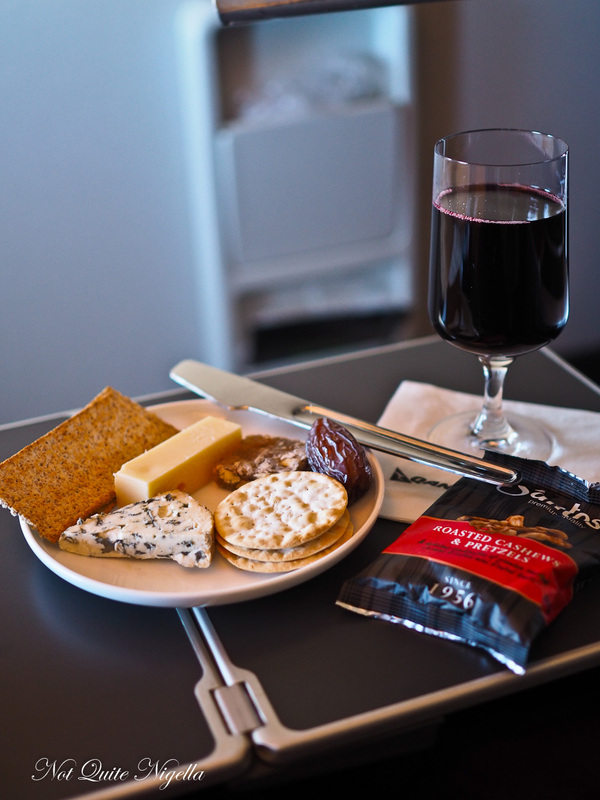 He brings me some cheese, biscuits, date and a fennel sweet and a generously poured glass of red wine. Heaven. My headache slips away quickly. The food comes by about half an hour later. There's an entree, main and dessert to choose from and the Korean style yellowfin tuna tartare is proving popular in the cabin with everyone around me ordering it. It was a toss up between this and a Mezze plate but I felt like something fresh. It is sweet from nashi pear, spicy from chilli and aromatic from the sesame. 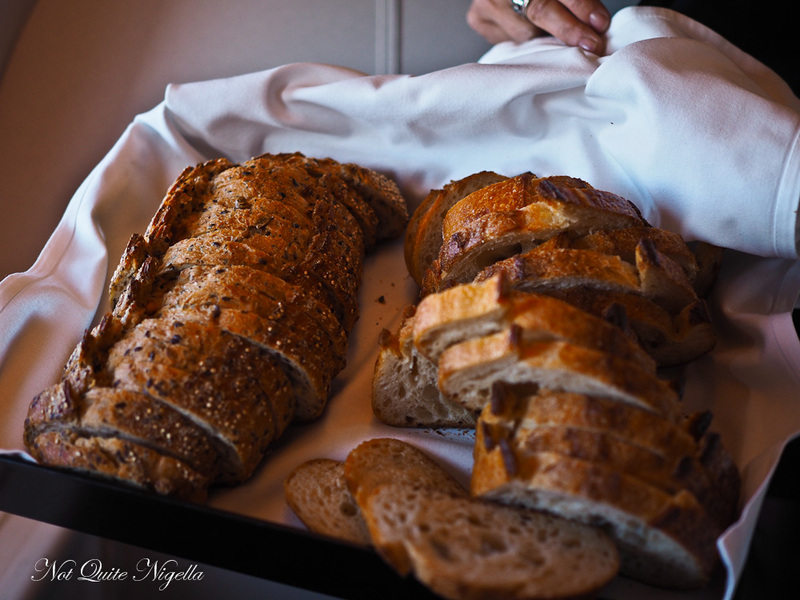 I have it with a green leaf salad with Rockpool vinaigrette and there are slices of real sourdough bread (white and multigrain) available with Pepe Saya butter. A little tray of salt and pepper comes with it and I promptly spill it all over my tablecloth. Oops. 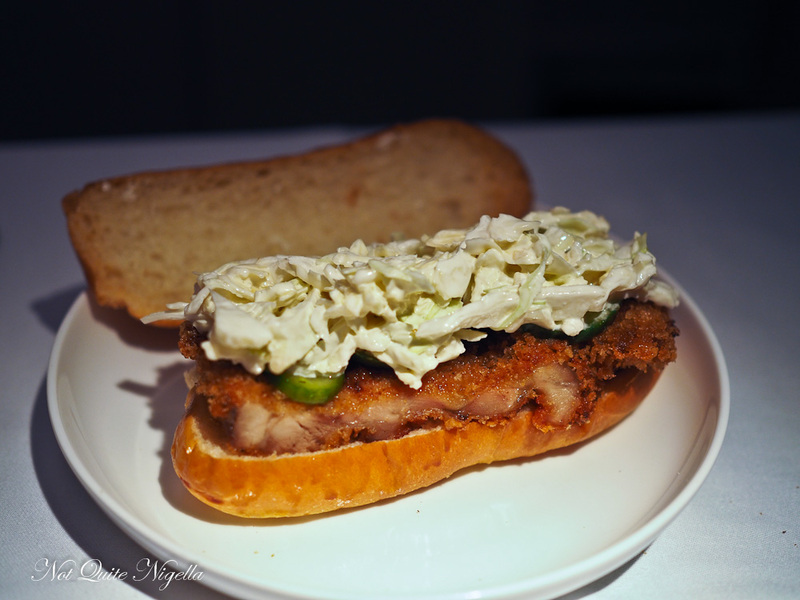 My choice for a main is a chicken katsu sandwich on a toasted milk bun with cabbage slaw, tonkatsu sauce and cucumber pickles. It reminds me of the very popular Qantas steak sandwich with coleslaw. I take off the top bun (it's a bit too crispy) and eat it as an open faced sandwich-it's now my favourite above the steak sandwich. The katsu still remains a bit crispy in the bun. So far it has been almost 2 hours since takeoff and I've started and stopped 4 films prematurely before watching some of Mariah's World and then ended up with the Kardashians. KUWTK is the kind of show that I watch and then hate myself for watching afterwards. I don't know why. It's like that fried chicken that you enjoyed but had regret for afterwards. The television is adjustable so that you can tilt it towards you if you are sleeping. 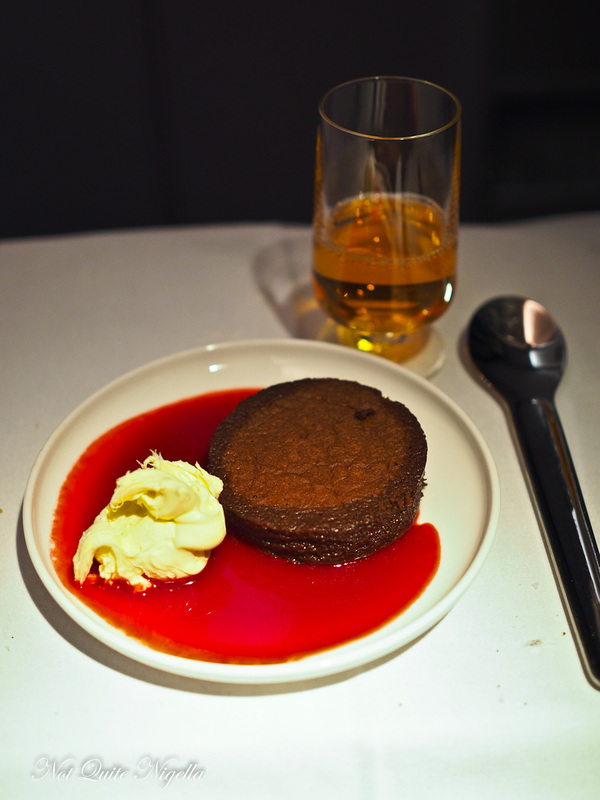 Dessert is their signature flourless chocolate cake, a super light chocolate cake with an almost mousse like quality to it. It comes with double cream and raspberry sauce. The Valrhona chocolates which I love don't make an appearance so I decide to go to sleep since I've got another flight to go after this one (Santiago to Lima). I fall asleep to the vocal fry tones of the Kardashians and their family drama. I get a couple of hours sleep and try studiously to avoid looking at the time in Sydney. I wake to the sound of cutlery clinking and people around me having breakfast. 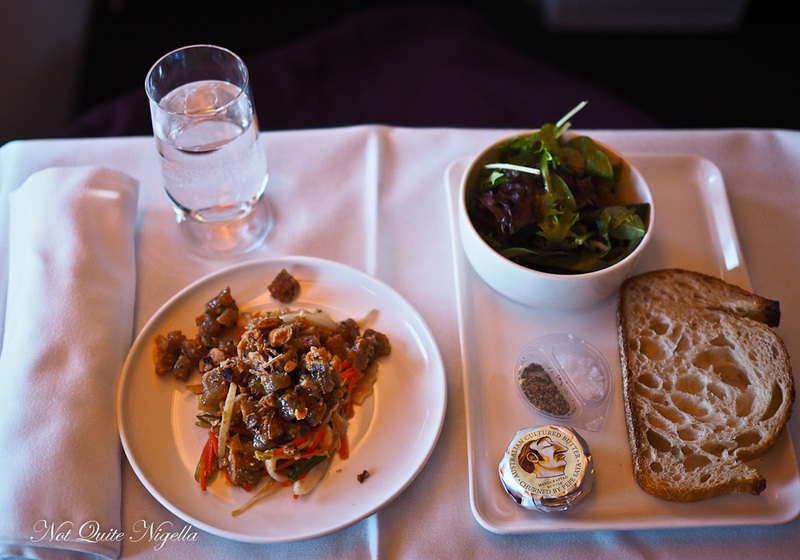 In economy they wake the whole cabin to eat at the same time but here in business the cabin is smaller that allows the crew to serve people when they wake up. 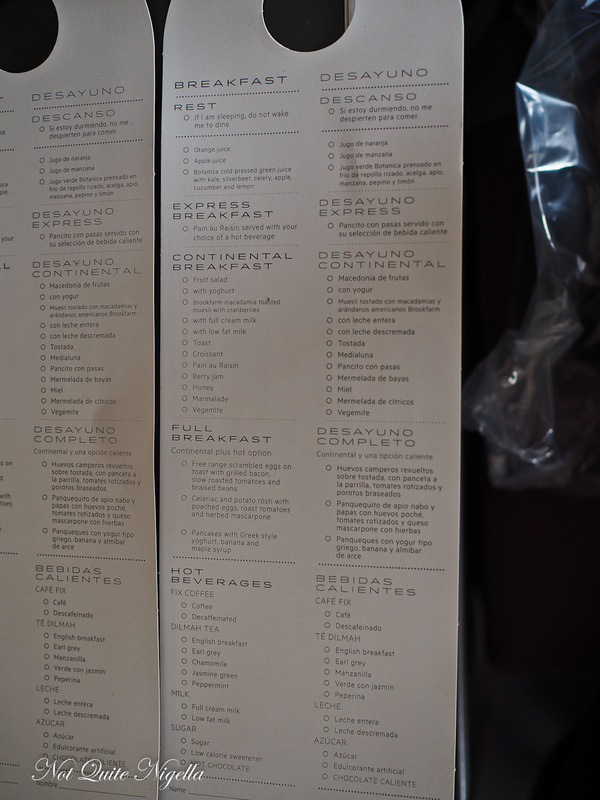 Earlier during the flight we had filled in a breakfast slip not unlike a hotel room service breakfast slip. My cup of tea arrives along with my hot main. I had thought that it came with a continental breakfast but it doesn't which is fine because I am still full from dinner. My main is a celeriac and potato roesti topped with herbed mascarpone which is pretty good I have to say. 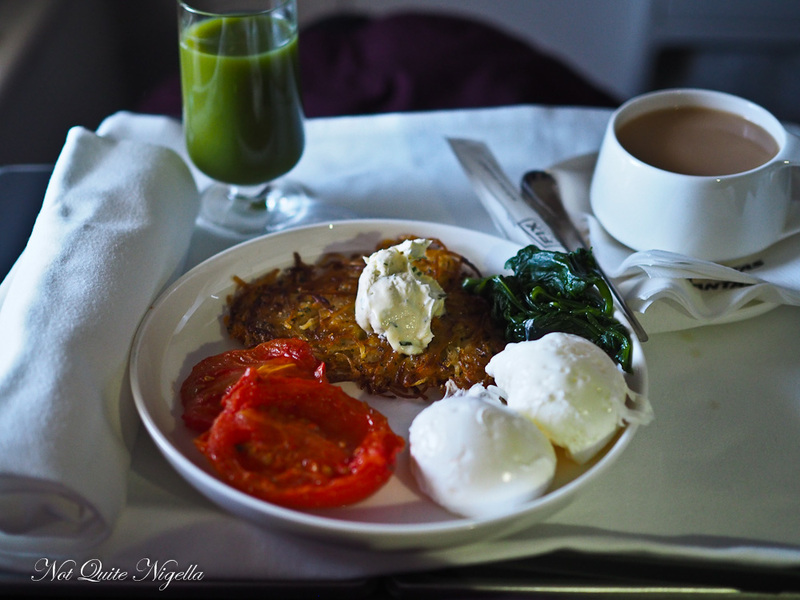 It is served with two perfectly poached eggs and a sweet roast tomato and sauteed spinach. And that leaves just enough time to get changed out of my pyjamas and board my connecting flight to Lima. Everyone on board is eagerly talking about visiting Lima and climbing Machu Picchu and I feel rested and ready to explore Peru! 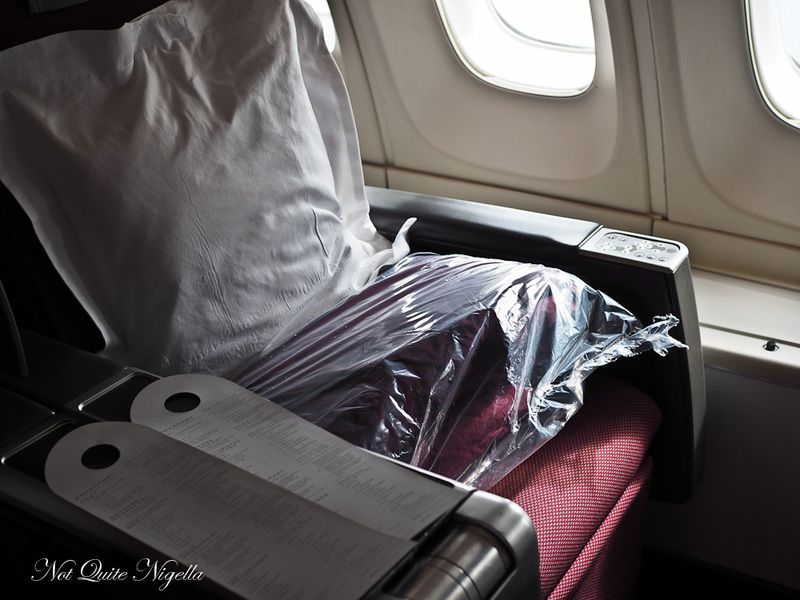 So tell me Dear Reader, what do you like to have around you all the time on a long haul flight? And do you watch Keeping Up With The Kardashians? 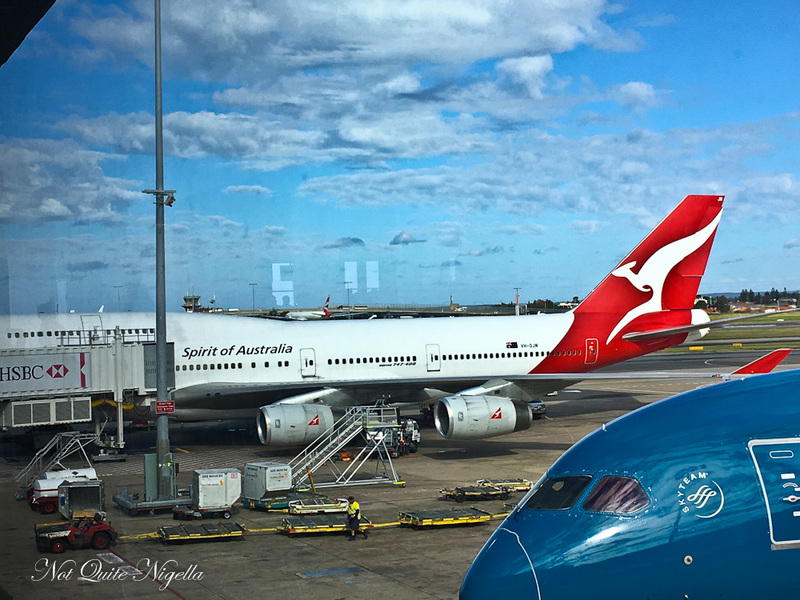 NQN was a guest of Qantas but all opinions remain her own. 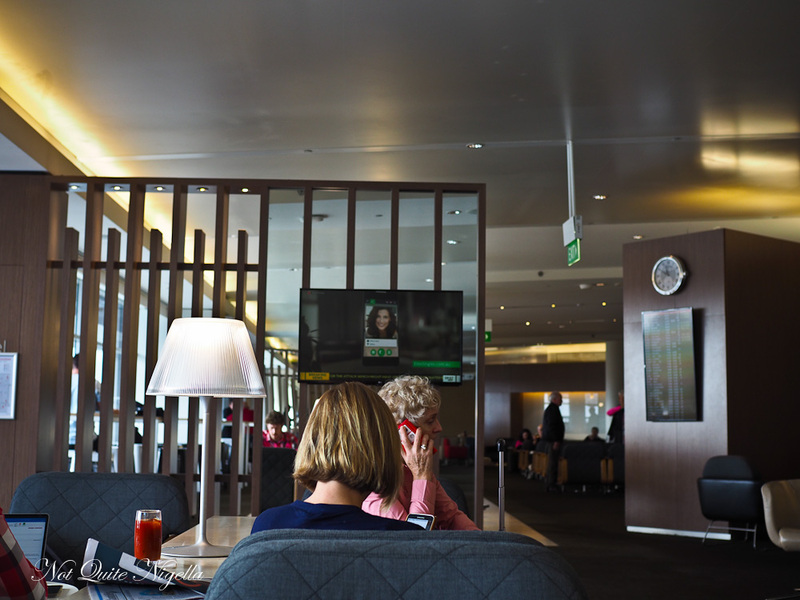 travelFlight Review: Emirates Business Class Dubai to Bologna & The Refurbished Lounge!